By attaching the lens to the housing with the M62 mount or a macro port, macro photography beyond the camera's or the lens's original performance will become possible. Using the M67-M62 Step Down Ring, the lens can be mounted on the DX Macro Port 50 II. With the M52-M62 Step Up Ring, the lens can be mounted on Olympus's various waterproof cases. Magnification can be multiplied by stacking them. 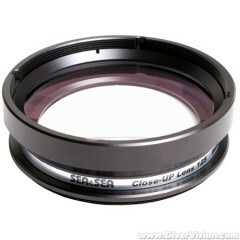 It can offer 62mm threaded port camera housing. *When the lens is used, move the zoom lens to the tele position. *When the lens is mounted, the depth of field will be narrowed.